I FINALLY got my Harley! My Dad bought me my 1st bike when I was ten.... My husband & I have had bikes our entire marriage. Last year, on his way to Afghanistan, my middle son was stuck in Kuwait & decided to buy me a Harley!! He had it shipped back to the USA & in 11 months, I've put almost 6000 miles on it! He was here last month for a 3 week leave, and we taught HIM to ride on the bike he bought for me. I must've done something right. 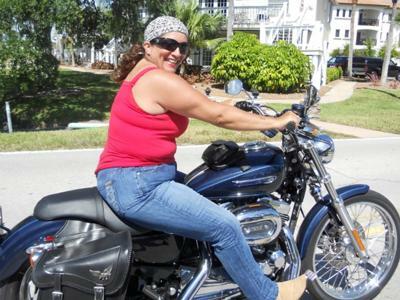 It's an HD Sportster Custom 1200...loads of power, just the right seat height, & not too heavy. It is the best gift ever....besides three great sons!! Comments for I FINALLY got my Harley! What a wonderful son! Tell him we REALLY appreciate his service to our country! My BFF, has an '08 1200 Low in the same colors. She calls her Blue Butterfly. You look so happy on your bike! It's great about the Harley, even more great that your son serves his country. My son was in Iraq. It is a hard row to hoe. Be strong and love the bike like you love your son. What a great gift your son gave you, You must be a very proud mother. Your bike is beautiful and knowing it came from him must make it all the more special. Enjoy, safe riding and a thank you to your son from my family. to your son for his service, and to your family for the sacrifice of being without him. God speed. What a wonderful gift from your son. Thank him for serving in the cause for America's freedom.